(via NASCAR Wire Service) DOVER, Del. 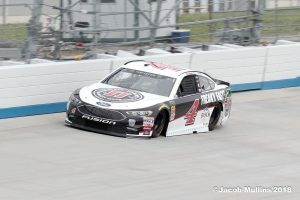 – The only thing that could have stopped Kevin Harvick on Sunday at Dover International Speedway was a sudden rainstorm. Eight laps after Sunday’s AAA 400 restarted from a rain delay of more than 40 minutes, Harvick passed Stewart-Haas Racing teammate Clint Bowyer for the lead and pulled away to win his fourth race of the season by a whopping 7.450 seconds. All told, Harvick led 201 of the 400 laps, swept all three stages and reestablished his No. 4 Ford as the dominant car in the Monster Energy NASCAR Cup Series. 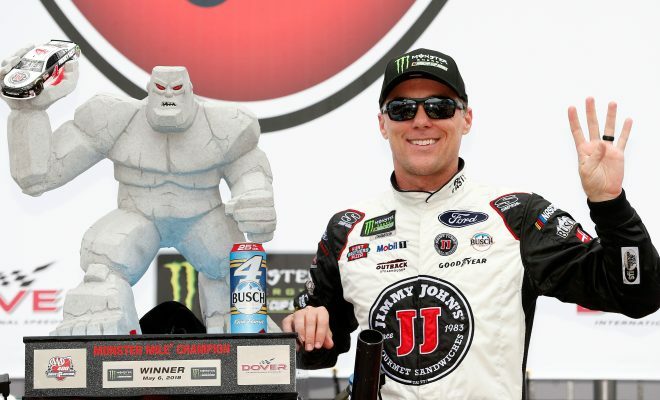 “It’s fun racing your teammate,” said Harvick, who won for the second time at the Monster Mile and the 41st time in his career, breaking a tie with NASCAR Hall of Famer Mark Martin and taking sole possession of 18th all-time. In fact, Harvick and Bowyer are close enough to have ribbed each other throughout the weekend. “I’m thinking, ‘Oh, my gosh, I’ve talked so much trash to him all weekend, and he’s already told me that the karma train is going to run me over’ when it started raining,” Harvick quipped. 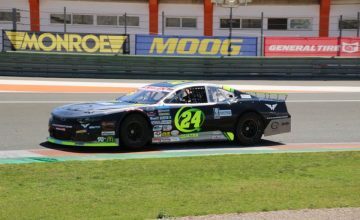 “But we had a fun weekend, just because when you come to Dover, I feel like when you come to Dover, I feel like Clint is going to be one of the people that you have to beat just because of the fact that he’s been so good for so many years here. Bowyer was relegated to second place after leading when NASCAR red-flagged the race for rain after 320 laps. But the rain abated, the track dried and Harvick made short work of his teammate after the resumption. “If we’d had a chance to adjust our car in clean air…” Bowyer said. “He (Harvick) had that luxury all day long. I knew, man. (My car) took off, and it was turning really, really good. And it kind of needs to be tight and work into that. I knew when it took off as good as it did and was rotating as good as it did that I was in trouble. Daniel Suarez finished third, a personal best on an oval track and matching his career-best third-place run last year at Watkins Glen. Martin Truex Jr. came home third, and Stewart-Haas driver Kurt Busch ran fifth, placing three SHR drivers in the top five in a race for the first time in the organization’s history. Brad Keselowski, Denny Hamlin, Ryan Blaney, Jimmie Johnson and Kyle Larson completed the top 10. Larson won the pole on Friday but didn’t start there. When his car failed pre-race inspection for the third time on Sunday, car chief David Bryant was ejected from the track, and Larson was sent to the rear for the start of the race, joining Austin Dillon and Alex Bowman, whose cars also were three-time losers in the inspection process. Larson spent the majority of the race a lap down after drawing a penalty for an uncontrolled tire on a Lap 97 green-flag pit stop. The driver of the No. 42 Chevrolet finally returned to the lead lap as the beneficiary on Lap 272 but couldn’t fight his way through traffic late in the race. Series leader Kyle Busch exited the race after the drive shaft on his No. 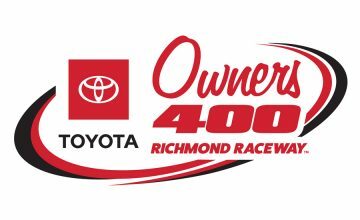 18 Toyota broke on Lap 272, causing the seventh caution of the race. Though he finished 35th, Busch retained the points lead by 22 over 13th-place finisher Joey Logano and by 40 over Harvick.